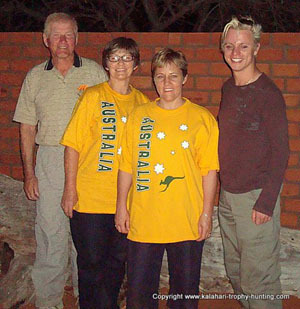 Kalahari Hunting News, Issue #10 -- Waltzing Matilda! If you can not see the pictures included in this mail, you can view our Newsletter on the Web. Just click here! African Hunting Stories... The First 12! Picture top right: Proudly displaying our Aussie-shirts. 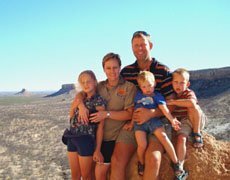 Scroll down to read more about John and Richard's time with us in the Kalahari. Winter has made way for spring here in the Kalahari and for most of us, including the animals, this is a time of new life, blossoms and leaves on the winter-dry bushes and shrubs. By September, the Kalahari's climate usually has warmed up enough to ensure that new leaves on bushes and shrubs are blooming. This provides welcome food after the dry Kalahari winter. This year however, the browsing antelopes' survival skills are tested to its limits. Several cold fronts resently moved into the Western Cape of South Africa and it caused cold nights as high up north as where we live. This slowed down the blooming of bushes and Kudus especially are now quite thin. All other game, on the contrary, are in very good condition since the Kalahari is still covered with last season's grass. This applies to Wildebeests, Eland, Hartebeest, Gemsbok and Springbok, etc. But you can just imagine how we await - together with all browsers - the coming of the first rains here in the Kalahari. 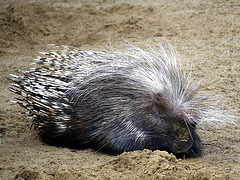 "The porcupine is the largest rodent in Africa. His quills don't really look dangerous, but it is. He may not be able to shoot it out when a predator comes, but it gets stuck when it gets in its skin. The quills are not barbed, but it sometimes breaks off and then the victim can't get it out and it may cause infection." 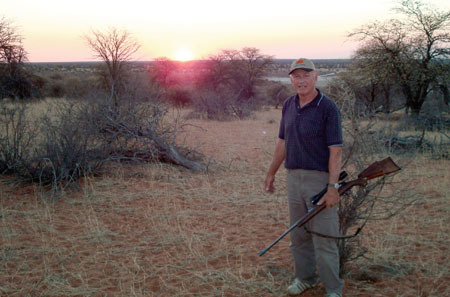 We ended the previous Newsletter with a few hunting pictures of Anton Coetzee and his friends. This group of 8 adults and 4 grown-up children hunted on Uitspan earlier this year. 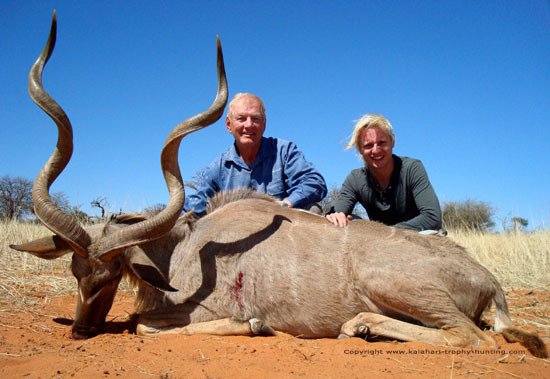 They took several Kudus and Gemsbok for meat purposes and also a Zebra trophy. 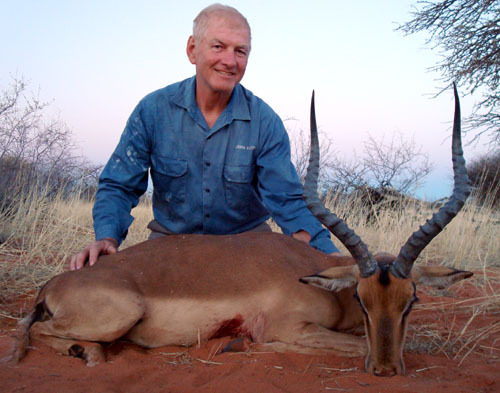 Anton has a tremendous love and appreciation for the Kalahari and always enjoys his hunts here very much. Read his comments after their latest visit here. 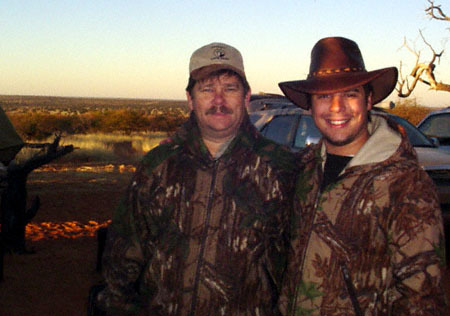 In September we've had the privilege to welcome John and Richard from Australia for a hunting safari on Uitspan Ranch. 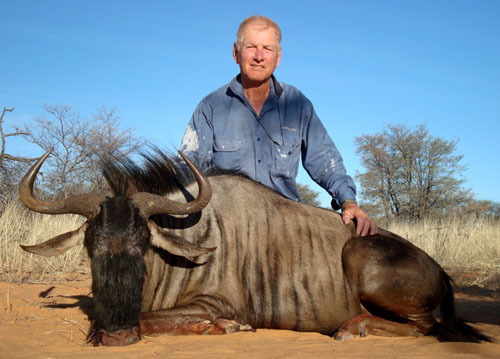 John stalked all his trophies and took a Kudu, Gemsbok, Impala, Springbok and Blue Wildebeest in 4 days. 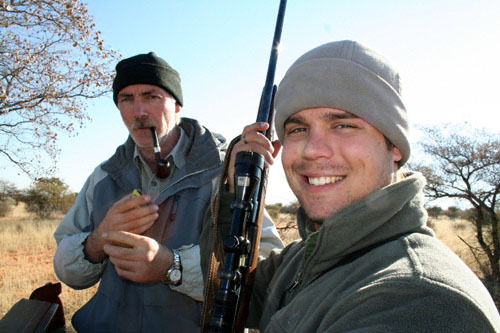 Richard joined the hunt as an observer. 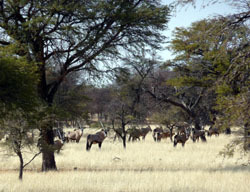 After their hunt with us, they undertook a tour through Namibia. We will publish more info and pictures of their hunt and Namibian experience in our next issue. 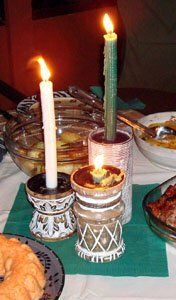 Well, we didn't sit beside a billabong or under the shade of a coolibah tree - but nevertheless feel like "Waltzing Matilda" all this time. We had an absolutely amazing time with the Aussies. It seems as if we, as southern hemisphere inhabitants, share many views on life, politics and love for nature. "Like music and art, love of nature is a common language that can transcend political or social boundaries." Recently, there has been a lot of discussion and controversy about Namibia's desert Elephants. The Ministry of Environment and Tourism says Namibia has more elephants now than at any other time in the last 100 years. Growing at a rate of 3.3 percent per year, the country’s elephant population is more than 20 000, up from 16 000 in 2004. Minister of Environment and Tourism, Netumbo Nandi-Ndaitwah, said on Monday the entire population especially that of the Kunene Region was healthy and growing, with the levels of consumptive off takes being very conservative and being below the sustainable off takes. Nandi-Ndaitwah was reacting to an article that appeared in a local English daily recently about three elephants that were allocated for trophy hunting. The article said there were fears that the action could reduce the number of already endangered rare desert bulls. At the end of July this year, Michael and I tackled the long-planned renovation process of our own house (for those of you who haven't been here - there are two homesteads on Uitspan Ranch and also a separate camp where our hunting clients are accommodated). Amidst all this packing and moving out, we received a large number of hunting requests for 2009. We always love to communicate with hunters from all over the world and this "heap" of requests from our website kept us very busy, but we still find it interesting and enjoyable. So... now we are looking to an almost booked-out 2009 (except for the months of March and September of which we still have some open spaces). Hunters from USA, New Zealand, Ghana, Italy and South Africa will all contribute to an exciting and interesting 2009 Hunting season on Uitspan Ranch! As mentioned in our previous issue, Roger win our Hunting Story contest. We interviewed Roger per mail and here you can enjoy again his views on hunting. There are several reasons why I enjoy hunting. First is my love and fascination for all the wonderful animals. I know that to most non-hunters this seems absurd. To a hunter, it makes perfect sense. To pursue these wonderful creatures in their natural habitat, to match wits with them, to observe their beauty, uniqueness, grace, strength, speed, resilience, and intelligence is an experience that is indescribable. I love being close to them, and sharing their world. To come away more often than not having been out-witted by an animal helps to keep life in the proper perspective. Hunting also takes me to locations that I would otherwise never see, and in some instances, the sights and sounds that I am fortunate to be a part of is an experience few people are lucky enough to observe. And finally, hunting is my escape, my salvation. When the stress of life seems to be getting the best of me, I am able to rejuvenate my mind and soul. Whether I am high on a mountain top looking out across the vast wilderness, or looking out across the endless plains, all my senses are focused on one thing. For that brief time, the troubled thoughts that occupy my mind are absent, and I am at peace. Returning to Africa...to what do you look forward to most? The people, the animals, and the sundowners! No question! As I sit here trying to come up with half-way interesting and intelligent answers, my mind is already filled with excitement and expectation. I can't wait to meet the people that have already started becoming my friends. One of the things that occurred to me early on, when I first began to peruse your web-site, was the wonderful family atmosphere and genuine friendliness that all of you have displayed. When you travel half-way around the world, one of the most important things is the people you meet, the people who share in these once in a lifetime experiences. In entering the contest, I wanted to meet all of you, and I can't tell you how grateful I am to have this opportunity. I obviously can't wait to observe all the animals once again, and in particular that special Kudu bull that has been beckoning me for the past 8 years. And last, but certainly not least, I look forward to the sundowners. To pause at the end of a glorious day of hunting, sip a cold drink, perhaps smoke a special cigar, and sit with my friends as I watch the breathtaking sunset as it silhouettes the African skyline. I can't wait! Read the rest of the interview at this link. We did some updates on the Special Hunting Packages offered on our website. You'll see that our packages are really unbeatable. We made it available for booking until November 1st, 2008. After that, we'll have no choice but to adjust the prices. Do not miss this very informative article by Stephan Hofmann. The link above will open it for you. Add YOUR advise and comments to this page to help future travellers with their plans and logistics. The "African Hunting Story Contest" was a great success - thanks to the authors who entered their special experiences. I am placing the links again in our Newsletter... for all of you to enjoy these great African Hunting stories. If you would like, you can click here to read all the submitted Hunting Stories! Below are links to the hunting stories which the judges put in the first 12 places. Make sure to read them.... it is as good as going on a safari yourself! Congratulations to all these authors! Click here to get ALL the info you need about hunting with us! We added a new Newsletter-comments page on our website. This is especially for those of you who would like to send a comment on Kalahari Hunting News. So... please take a moment to Comment Here! A desire does not mean that one has the ability to do that which will fulfill it. One with a malignant tumor will want it removed; but he surely cannot do that himself. So the child of God, because of his new spiritual life, will want to be freed from Satan's power and to be able to keep God's law perfectly, and will say to the world, "Depart from me ye evil doers: for I will keep the commandments of my God." (Psalm 119:115) But because he cannot make them depart, he prays to God: "Uphold me according to Thy word, that I may live: and let me not be ashamed of my hope. Hold Thou me up, and I shall be safe: and I will have respect unto Thy statutes continually." Psalm 119:116, 117. What we say then to the world, and to Satan the prince of this world, must be in perfect harmony with our prayer to God. If we really want to walk in love to God, we must tell the world to depart from us. We cannot have fellowship with God and those who hate God. Join the world in its carnal entertainment and glorification of sin, and you do not mean it when you pray, "Let me not be ashamed of my hope." In Romans 1:32 Paul exposes the evil of having pleasure in them that have pleasure in sin. And the psalmist reveals a very important truth here. We must realize our complete dependency upon God for a righteous walk. Think that you can do that alone, and you do not really want to walk in love to God. And you do not really see how much Satan has you in his power. And ever follow Thy command. We are safe because we are upheld according to God's word. And that word assures us that we are safe in the arms of Jesus, Who blotted out our sins and now has all power in heaven and on earth to bring forth presently, and now keep, a perfect church to God's glory. ..."If we do not prefer the Church to all other objects of our solicitude, we are unworthy of being accounted among her members." 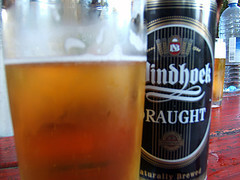 Last month, National University of Lesotho scientists released the results of a recent analysis that revealed the presence of female hormones in beer. Men should take a concerned look at their beer consumption. The theory is that beer contains female hormones (hops contain phytoestrogens) and that by drinking enough beer, men turn into women. 7) Failed to think rationally. And send it to your women friends to give them a good laugh! If you think they can handle it! I created this website with the help of SBI. Click here to read about my experience...!